We know this very well how beneficial drinking water just after getting up is and so many of us practice is too. 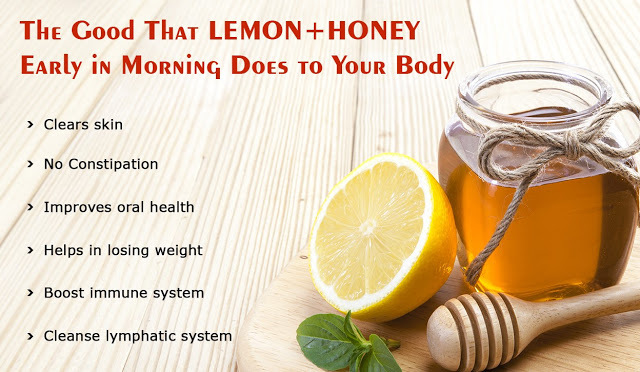 But when we add honey and lemon in warm water and drink it daily, the benefits gets multiplied. Let’s see how it is achieved. Drinking warm water mixed with honey and lemon is very good for health. It helps in losing weight and for this simple reason people who want to lose weight should take it for sure. This combination of warm water, lemon and honey is so good for health that if taken on an empty stomach it is helpful in keeping constipation at bay. It stimulates the digestive system, infuses water in dried stool which removes constipation completely. Lack of water in already dehydrated lymphatic system leads to problems like fatigue, disturbed sleep and blood pressure level and hinders mental development. But when you take water with lemon and honey, the lymphatic system gets hydrated and your body functions properly. Taste of honey and lemon removes any kind of bad breath in your mouth. Also, these keep your mouth bacteria-free and that’s how without direct care, mouth gets benefited indirectly. Vitamin C helps in fighting cold. As it is high in potassium, it controls blood pressure as well as stimulates brain function. Presence of Vitamin C removes blemishes and wrinkles from the skin. Also, it gives a brighter and glowing look. As a result of drinking lemon and honey in water, your skin gets cleared giving your face a cleaner and fairer look.